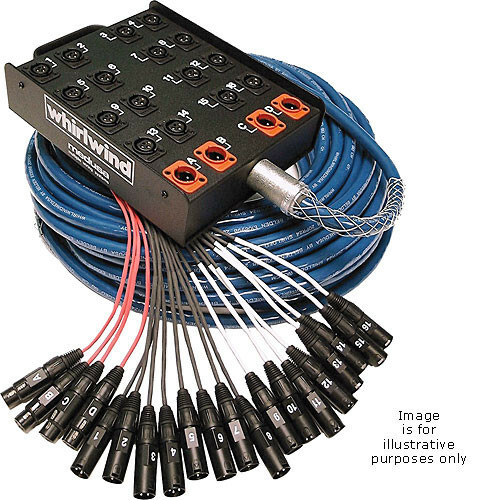 This Whirlwind Medusa Standard Series 8 Channel (0x Return) Snake is a snake cable with a heavy-duty steel stagebox at one end and a fanout at the other end. The cabling consists of heavy-duty, flexible Belden CM rated multipair cable. Each pair contains two twisted 24GA 7x32 polyethylene insulated conductors with 100% foil shield and 24GA drain wire. Medusa Standard 8 Channel (0x Return) Snake - 100' is rated 5.0 out of 5 by 1. Rated 5 out of 5 by Edward from Good Service for a Reasonable Price This is my 4th Whirlwind 8 channel snake, and 3 are in service. (The 4th is an 8x4, and is bulkier than I prefer to carry.) The connectors are Neutrik and the pigtails are reasonably protected with heavy shrink tubing. 100' just barely fits on a plastic extension cord reel designed for 150' of 16x3 power cable. Technically, this is a sub-snake, because the stage box connectors are not locking. That's okay with me, because stage boxes get a lot of abuse. If the lock tabs get bent, you can't remove the plug easily. The blue vinyl jacket doesn't lay flat like rubber, but is smaller and tougher. I tape everything down, so there's no tripping problem. I run them into a 32x16 digital stage box, which can be located up to 100 meters from the mixing console, or directly to a recorder for smaller jobs. "Snakeskin" on the pigtails would be a worth while investment, but custom order only.